Photo: Peter English. Luxury Ecuador Tours & Travel. The land price includes escorted transfers, private excursions with a native guide and a naturalist, entrance fees, private bungalow with private bathroom, gourmet cuisine (see details), all land and water transportation, and travel insurance for guests through the age of 59 years (over that age, there is a supplementary fee). All prices are per person based on two people sharing a guest room. For a detailed description of our services, see Opulent Itineraries. Season: The parrot clay licks are most active from October to April, with a peak in December and January. Excursions depart every day but Sunday. Day 1: Quito - Coca - Napo Wildlife Center. Transfer to the airport. Flight to Coca. Arrival at the airfield and reception. Riverboat down the Napo River and dugout canoe up a blackwater creek to the lake and lodge. Overnight in the Napo Wildlife Center. Days 2 & 3: Napo Wildlife Center. Jungle excursions. Overnight in the Napo Wildlife Center. Day 4: Napo Wildlife Center - Quito. Canoe to the Napo River and riverboat to the Coca airfield. Flight to Quito. Arrival, reception and transfer to the Casa Gangotena. Dinner at Alma. 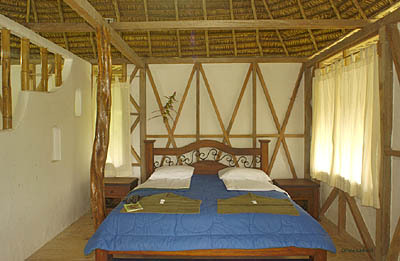 Overnight in the Casa Gangotena -- Plaza View Room. Day 5: Quito - Your next destination. Continue on a cruise of the Galapagos Islands or an exploration of the Ecuadorian Andes. The Amazon Basin is famous for its wildlife, but not for its creature comforts. 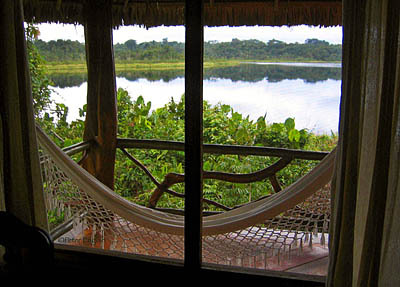 With the Napo Wildlife Center, you get the best of both worlds. Here, you can see thousands of parrots at the two, nearby parrot clay licks, Giant Otters in the lake and streams, 11 species of monkeys in the trees and over 550 species of birds in the forest. When your day is done, you can take a hot shower, sit on your private porch overlooking the lake, have a cold beer from the bar and enjoy a healthy international dinner. This is the jungle in style. From start to finish, the Napo Wildlife Center combines creature comforts with incredible wildlife. Bilingual guides explain the intricacies of the rainforest while the staff works to make your stay the trip of a lifetime. And why wouldn't they? They are not only your staff but also major stockholders of the lodge! In addition to being the best wildlife lodge in the Amazon of Ecuador, the Napo Wildlife Center also conserves 82 square miles of pristine rainforest in its private reserve, based on a conservation partnership with the local community. Photo: Pete Oxford. Luxury Ecuador Tours & Travel. 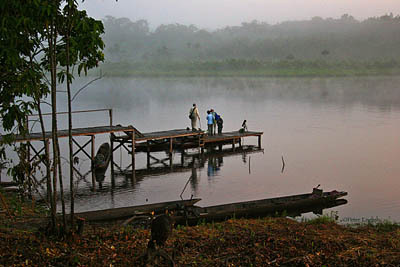 An early morning at the dock, Napo Wildlife Center, Ecuador. Visitors will be led by a native Añangu guide, an expert on the rainforest's secrets, and a naturalist, knowledgeable in tropical forest biology. Both of your guides, with their unmatchable enthusiasm, will create informative and enjoyable excursions every day, each tailored to take advantage of the peaks of animal activity and weather conditions. Some outings will be before dawn or at sunrise to maximize wildlife observation, and others in the afternoon or at night. Photo: Marcia Strouss. Luxury Ecuador Tours & Travel. The two most accessible parrot clay licks in Ecuador are part of the Napo Wildlife Center reserve. We have constructed viewing blinds at each of these clay licks so that visitors can comfortably watch as hundred of parrots and parakeets come to eat the clay that aids in the digestion of their diet of unripe seeds and fruits. 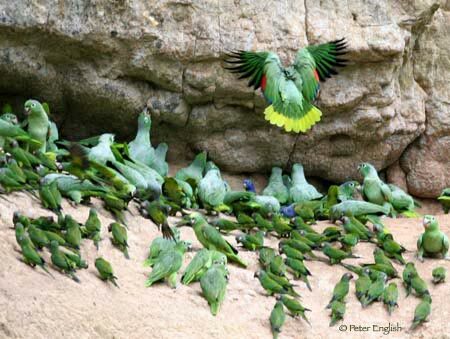 Parrots visit the clay licks at different times of day, so it is easy to visit both clay licks in a single outing. Activity kicks off at the main lick between 7 to 8 in the morning and at the second lick after midday. Species include Mealy, Blue-headed, Yellow-crowned, Orange-winged and Orange-cheeked Parrots; Cobalt-winged, Dusky-headed and White-eyed Parakeets; and the occasional rarities, like Scarlet Shoulder Parrotlet and Scarlet Macaws. In the best weather conditions, at least 800 individuals and most species can be spotted, and on other days, in spite of the rain, one can still see a few dozen. You could make it a full-day excursion, visiting both blinds, equipped with a freshly-made box lunch, or a half-day, visiting the main lick and returning for lunch at the lodge. Photo: Luis Claudio Marigo. Luxury Ecuador Tours & Travel. Once thought to have been hunted to extinction in Ecuador, Giant Otters thrive in the lake and streams surrounding the Napo Wildlife Center. These seven-foot-long (two-meter-long) otters are unique to tropical rivers of South America and can be individually identified by their white throat patches. 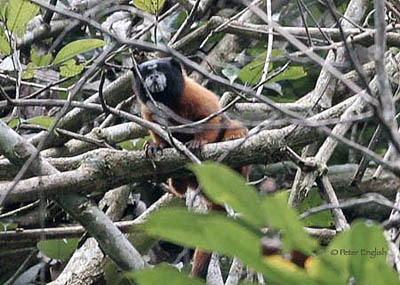 Golden-mantled Tamarin Monkey, Napo Wildlife Center, Ecuador. of other primates guide our day. Only 35 minutes from the lodge is the most professional canopy tower ever built in Ecuador. Designed to provide maximum safety to users, this stainless steel structure complies with international standards. It is over 125 feet tall and right next to a giant, 155 feet kapok tree, where a platform provides ample space for 15 guests and views of Howler, Capuchin, Monk Saki and Spider Monkeys in the nearby forest. On a clear day, the view extends to the Andes, where Gran Sumaco and the snow-capped Antisana and Cayambe volcanoes can be seen. In addition to mammals, such as the Three-toed Sloth, active feeding bird flocks reach the vicinity of our kapok tree, offering sightings of more than 80 species in a single morning -- among them, large toucans, macaws and colorful tanagers -- and making the canopy platform into a paradise for avid birdwatchers and nature lovers. Recent visitors have seen the Ornate Hawk Eagle, Crested Eagle and Harpy Eagle at the canopy tower for four consecutive days! into a dimly lighted tunnel of mangrove and fig trees. 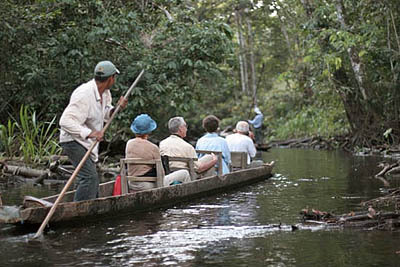 The Napo Wildlife Center has a large lake with two streams that can be quietly explored in a dugout canoe paddled by our expert guides and staff, eager to spot and show you wildlife. 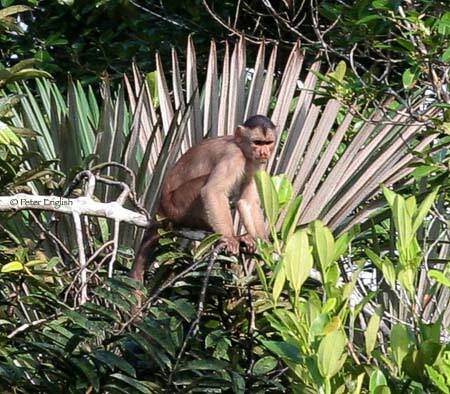 The possibilities are great for finding monkeys, like Squirrel, Saddle-backed and White-fronted Capuchin or those that inhabit only our south side of the Napo River, such as Monk Saki, Spider, Woolly and Golden-mantled Tamarin Monkeys. 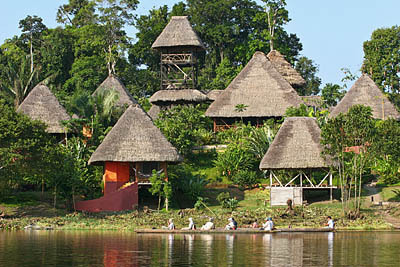 Napo Wildlife Center is home to 11 species. All four species of caiman are found here, including Black Caimans, which can easily be seen during nocturnal canoe rides or even on sunny days by the edge of floating vegetation. 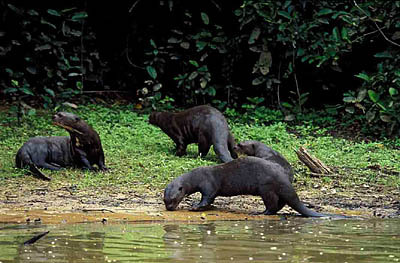 Following the streams, there is a good chance to observe Giant Otters. Streams have dense vegetation on both sides, large trees overhead and calm flowing waters. No one knows exactly what awaits in the next meander: a flooded forest with anaconda or a gentle, easy-moving, Three-toed Sloth! Rufescent Tiger Heron, Napo Wildlife Center, Ecuador. began rising with the sun. Hikes along a variety of forest types are possible on different trails. One can appreciate the biological richness of the tropical forest -- discovering new plants and colorful or well-camouflaged insects. On forest trails, guests can see monkeys, lizards, tortoises, frogs and army ants in addition to an array of birds, including toucans, macaws, parrots, manakins and hummingbirds. Our staff is constantly aware of wildlife movements and they report to each other when and where it will be best to look. This is a territory of rich biodiversity, the land of anything is possible and expect the unexpected. The largest mammals like Jaguar, Puma, Tapir, Giant Anteater and Giant Armadillo have been spotted in our area. 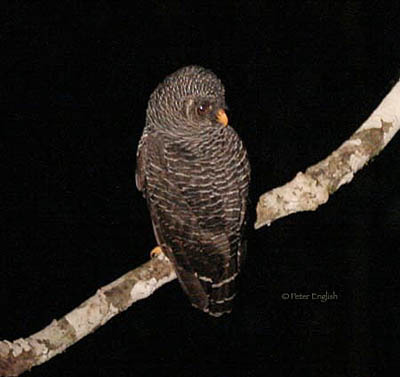 Black-banded owl, Napo Wildlife Center, Ecuador. 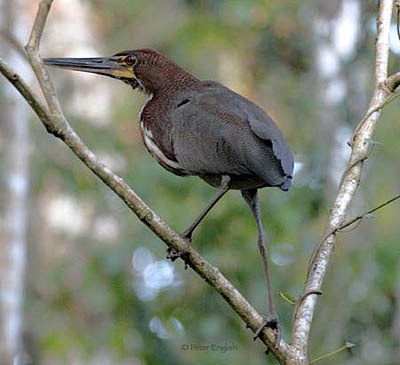 Jiovanny spotted a zigzag heron, a rare trophy for a birder's life list. Over 562 species of birds have been recorded at the Napo Wildlife Center, more than one-third of all of Ecuador's birds -- a vast and rich bird life that can reward the most avid birdwatcher with the unrivalled, south Napo River species. Napo Wildlife Center and Añangu are a classic location for travelers to Ecuador who seek overwhelming bird diversity. Agami and Zigzag Herons are found near the lake and creeks, including all five kingfishers. The large raptors like Harpy and Crested Eagles find healthy mammalian food in our area. The active calls of the forest-floor, mixed-species flocks with the largest numbers of the surprising antbirds can be found. Canopy flocks are normal to run into, chances are that birds provide an hour or so of a multitude of "wow"s. Gear up with the best binoculars for the most superb views and active excursions, helped with the expertise of the top native bird guide along the entire Napo River: Jiovanny Rivadeneira. He is the head of a number of native guides that will eagle-eye sight and successfully find for you that great plumaged world. Our canopy tower provides unrivalled opportunities for birding at the best rainforest in the country. Panorama of the dining room and bar, Napo Wildlife Center, Ecuador. greeted us hospitably with bowls full of chicha, the local beer. Añangu is not only home to the Napo Wildlife Center, it is the ancestral territory of an indigenous Quichua community. The Añangu people are active participants in the conservation and management of a large territory within the National Park. We would like to invite you to see the community that had a dream and initiative a long time ago to manage this vast rainforest territory by establishing its own lodge, helped by the EcoEcuador Foundation. You can join some families on their daily activities when harvesting bananas, coco and manioc, or help prepare chicha, a traditional alcoholic drink. Try this unique experience with the Añangu, masters of the tropical forest. To get to Napo Wildlife Center, guests fly by jet from Quito to the town of Coca on the Napo River. After a short drive to the dock, we board a large, motorized, covered canoe for a two-hour trip downriver. Upon arriving at the entrance to the Napo Wildlife Center Reserve, we switch to smaller, dugout canoes and are paddled up the blackwater creek to the lake and lodge (no motorized transport is allowed on the creek or lake so that wildlife isn't disturbed). This paddle can take anywhere from one to three hours, as on the creek guests might see Giant Otters, potoos, kingfishers, Hoatzins, jacamars, hawks, and monkeys. We eat lunch en route and arrive at the lodge by late afternoon.